Following the Vatican Museums 3D and Florence and the Uffizi Gallery we now have a brand-new documentary on the life and work of Italian master Caravaggio and the birth of modern painting directed by award winning Mexican director Jesus Garces Lambert . The research is extensive – there are lots of interviews with various curators, archivists etc – and well ‘s presented. Some of the photography of the various places linked to Caravaggio’s life is stunning , some of it dizzying and overdone. We follow Caravaggio on his travels through Milan, Venice, Rome, Naples, Sicily and Malta as he attempts to flee his inner demons and various enemies he made along the way. 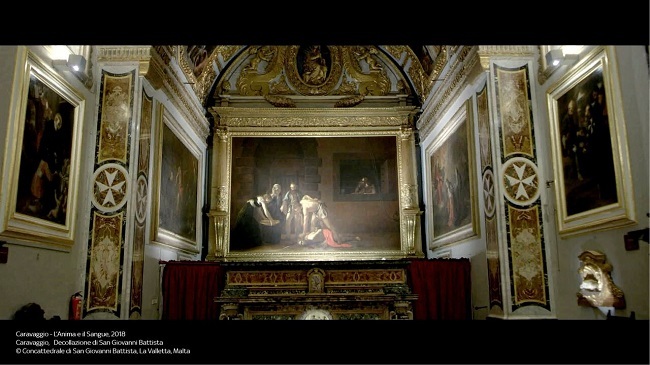 We see the various paintings in situ where possible and they are placed in context(eg the Contarelli Chapel). Generally the works are photographed in incredible detail and often in intimately revealing closeup. There are various sections where Caravaggio’s technique is analysed, his use of mirrors (sort of like a primitive camera obscura apparently) and how he sometimes adjusted works .Perfeecting the use of chiaroscuro, Caravaggio’s figures are modelled with dark shadows and set against gloomy backgrounds , eliminating unnecessary details and focuses the observer’s ¬attention on the decisive moment . We also learn how he planned and produced the ‘cartoons’ on the surface to be painted on . Both his religious works – Judith Beheading Holofernes , The Deposition From the Cross, The Calling of St Matthew , The Death of the Virgin and The Conversion of St Paul to name just a few — as well as his more worldly subjects like as Bacchus and Victorious Amor are included. There are also assorted portraits. We also learn a lot about his scandalous , tempestuous , dangerous life , often brawling and fighting .Generally the film proceeds in chronological order and shows the major events in Caravaggio’s life that are linked to the various works he produced at the time. ( How did he manage to fit everything in?) His models were street people and this also caused scandal and gossip (a prostitute, his friend Lena Antognetti, posed as his model for Mary in The Death of the Virgin) for example . Some models Caravaggio used repeatedly. Caravaggio’s death is somewhat mysterious ( was it murder ? lead poisoning? A fever? ) .His life was greatly controversial and his legacy inspired the Baroque. While informative and well narrated I was disappointed in the rather unnecessary contemporary ” inserts” that were in some ways performance art (a handsome male wrapping himself in clingwrap or covered in paint, dizzying shots of women dressed and posing as Caravaggio’s models) attempting to covey the documentary’s major theme… “Caravaggio’s chiaruscuro is a reflection of his own lightness/darkness”.. Hmmm. Caravaggio: the Soul and the Blood screens at selected cinemas from 19 May.